The NAC (NAM, ATAF1/2, and CUC2) transcription factor family represents a group of large plant-specific transcriptional regulators, participating in plant development and response to external stress. However, there is no comprehensive study on the NAC genes of Tartary buckwheat (Fagopyrum tataricum), a large group of extensively cultivated medicinal and edible plants. The recently published Tartary buckwheat genome permits us to explore all the FtNAC genes on a genome-wide basis. In the present study, 80 NAC (FtNAC) genes of Tartary buckwheat were obtained and named uniformly according to their distribution on chromosomes. Phylogenetic analysis of NAC proteins in both Tartary buckwheat and Arabidopsis showed that the FtNAC proteins are widely distributed in 15 subgroups with one subgroup unclassified. Gene structure analysis found that multitudinous FtNAC genes contained three exons, indicating that the structural diversity in Tartary buckwheat NAC genes is relatively low. Some duplication genes of FtNAC have a conserved structure that was different from others, indicating that these genes may have a variety of functions. By observing gene expression, we found that FtNAC genes showed abundant differences in expression levels in various tissues and at different stages of fruit development. In this research, 80 NAC genes were identified in Tartary buckwheat, and their phylogenetic relationships, gene structures, duplication, global expression and potential roles in Tartary buckwheat development were studied. Comprehensive analysis will be useful for a follow-up study of functional characteristics of FtNAC genes and for the development of high-quality Tartary buckwheat varieties. Transcription factors (TFs) play an important role in controlling multitudinous vital growth and development processes such as signal transduction, cellular morphogenesis, and response to environmental stressors during the growth and development of plants [1, 2]. TFs activate or inhibit the transcription rate of target genes by binding to specific cis-acting promoter elements to regulate gene expression [3, 4]. The NAC domain protein family is a larger plant-specific TF family. The family name is based on the three proteins: no apical meristem (NAM), ATAF1–2, and cup-shaped cotyledon (CUC), which all possess a similar DNA-binding domain [5, 6]. Typically, the structure of NAC proteins can be divided into conserved N-terminal DNA-binding domains and highly dispersed C-terminal transcriptional regulatory regions [7, 8]. NAC domains comprise five subdomains, A through E, located at the N-terminal, and usually contain approximately 150 amino acid residues, which are related to DNA binding, dimer formation and localization [9–11]. Since the NAC gene was first found to influence pattern formation in embryos and flowers of petunias , numerous studies have shown that the NAC protein is important for plant growth and environmental adaptation. [11, 12]. NAC genes affect many important biological processes. In Arabidopsis, NAP is involved in floral morphogenesis . AtNAC1 and AtNAC2 are involved in the development of lateral roots [14, 15]. CUC1 is the second gene indispensable for the formation of cup-shaped cotyledons . ATAF1/2 and CUC2 participate in cell division . RD26 and ANAC036 are involved in hormone signal pathways [18, 19]. NAM-B1 is involved in the deposition of nutrients in wheat grains [20, 21]. OsNAC5 may participate in nutrient substance remobilization from green tissues to seeds . NAC genes are also important regulators of plant abiotic stress response . In Arabidopsis, overexpressing ANAC019/055/072 enhanced tolerance to drought by stress-induced gene expression . In rice, the overexpression of OsNAC6/SNAC2 enhanced seedling tolerance to drought, salt, and cold stress [24, 25]. In Arabidopsis, the heteroexpression of active membrane-bound GmNTL1/GmNLT11 proteins was found to result in improved tolerance of abiotic stressors . In Capsicum, silencing CaNAC2 increased the sensitivity of seedlings to cold stress . In Tartary buckwheat, FtNAC4/6/7/8/9 was involved in responses to drought, high salt, cold, SA and JA stress . In addition, NAC transcription factors play an important role in secondary cell wall (SCW) biosynthesis in plants [29, 30]. In Arabidopsis, the dominant repression of VND6/7 (vascular-related NAC domain) causes an inhibition of secondary wall thickening in vessels . NST1 and NST3 (NAC secondary wall thickening promoting factor) regulated secondary wall biosynthesis, including production of xylary and interfascicular fibers and pod shattering, in a functionally redundant manner [32–34]. AtXND1 (xylem NAC domain 1) negatively regulated terminal secondary wall biosynthesis . In Medicago sativa, an MtNST1 gene mutant exhibited a lack of lignification in interfascicular fibers . In cotton, transgenic experiments indicate that GhFSN1 positively regulates SCW thickness . Tartary buckwheat is a widely cultivated dual-purpose medicinal and food grain crop that contains abundant proteins with a well-balanced composition of essential amino acids, and its content of amino acids is higher than that of primary grain crops. Tartary buckwheat is a rich source of vitamins B1, B2 and B6, dietary fiber and a variety of minerals, such as niacin, magnesium, manganese and phosphorus (adopted from USDA Food Composition Databases: https://ndb.nal.usda.gov/ndb/). Importantly, Tartary buckwheat is a rich source of beneficial phytochemicals. Flavonoids, especially rutin, have anti-fatigue properties and anti-inflammatory activity and can be used to treat microangiopathy [38–41]. Although NAC genes affect cell division and expansion , lateral root development [14, 15], maintenance of the shoot apical meristem , flower formation  and secondary cell wall biosynthesis [29, 30], there are still many problems to be solved. 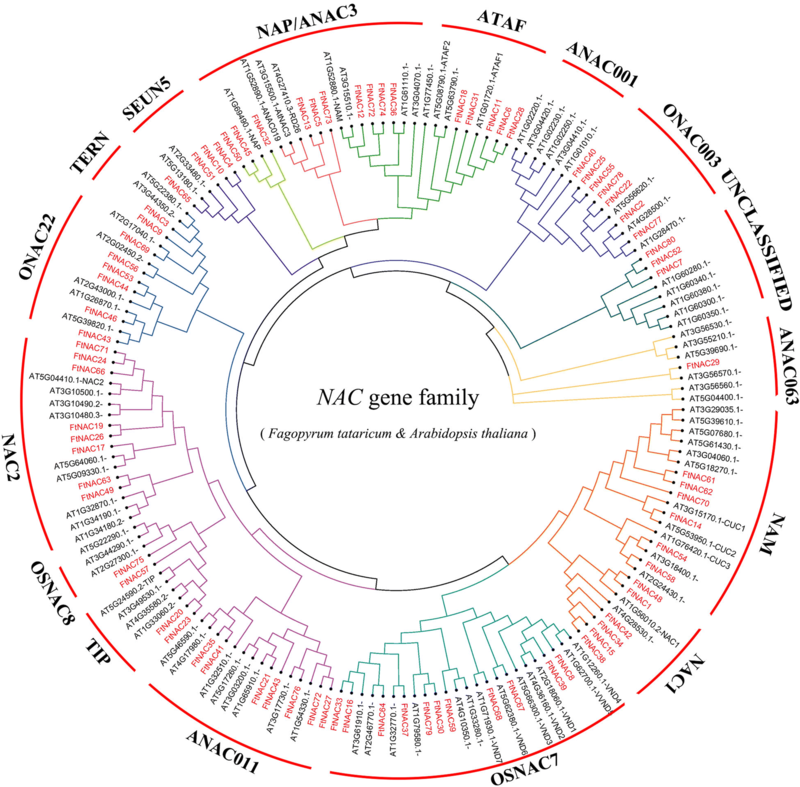 The NAC gene family has been widely studied in many species, such as Arabidopsis thaliana , rice , wheat , soybean , maize , potato , cassava , Chinese cabbage , pepper , melon  and apple . However, there is no systematic study of the NAC family in Tartary buckwheat. Due to the fact that NAC genes are crucial to many developmental processes and responses to abiotic stress, it is of great significance to comprehensively study the NAC family of Tartary buckwheat. The recent completion of Tartary buckwheat genome sequencing allowed us to study the NAC gene family of Tartary buckwheat at the genome level . To date, only the ARF and MADS gene families have been systematically analyzed in Tartary buckwheat [53, 54]. In this article, we report the gene structure, chromosomal location, duplication, global expression and potential developmental roles of Tartary buckwheat NAC genes. In addition, a homologous analysis between NAC genes in Arabidopsis thaliana, beet, soybean, tomato, sunflower, rice, grape and Tartary buckwheat was also conducted. The expression of FtNAC genes during plant development, especially fruit development, was comprehensively analyzed. This study is helpful as a follow-up study of the functional characteristics of FtNAC genes in the development of Tartary buckwheat. 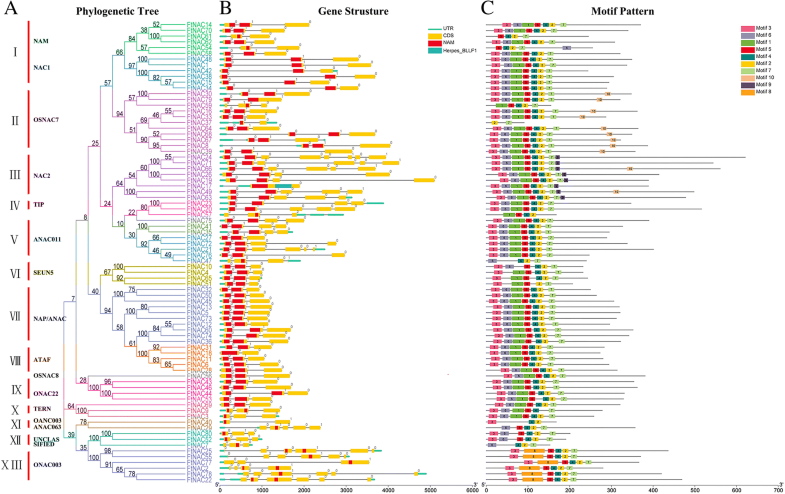 Eighty NAC genes were identified by the two BLAST methods, and the redundant forms of the same gene were removed simultaneously. In this study, FtNACs were named FtNAC 1 to FtNAC 80 according to their chromosome location (Additional file 1: Table S1). We introduced the basic information of 80 NAC genes in detail, including isoelectric point (PI), molecular weight (MW) and coding sequence length (CDS). Of the 80 FtNAC proteins, the smallest protein was FtNAC 37 with 91 amino acids, and the largest protein was FtNAC 24 (621 aa) (Additional file 1: Table S1). The MWs of the proteins ranged from 10.59 to 69.92 KDa, and the pIs ranged from 4.36 (FtNAC 7) to 11.46 (FtNAC 58). From the location information, we can see that 69 FtNACs were located in the nucleus, 4 FtNACs were located in the cytoplasm, 3 FtNACs were located in the chloroplast, 3 FtNACs were located in the mitochondria, and 1 FtNAC was located in the plasma membrane (Additional file 1: Table S1). 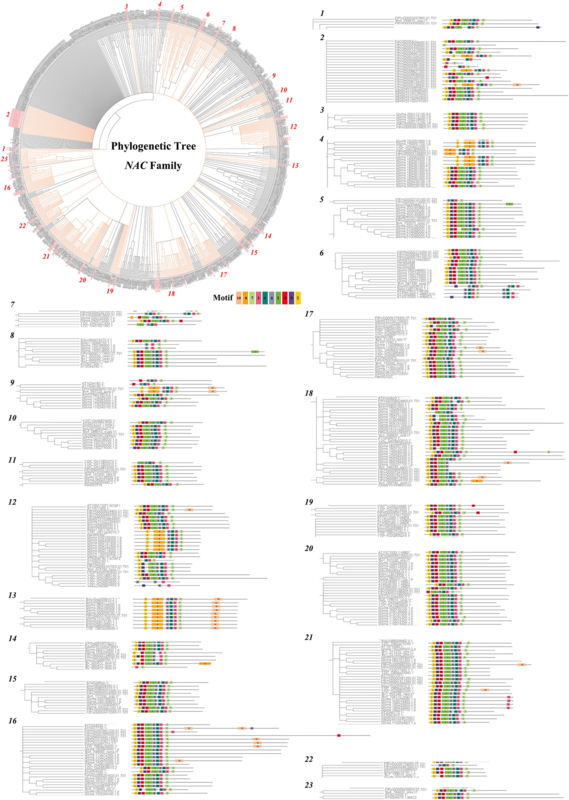 We used amino acid sequences of FtNAC and AtNAC proteins to construct an unrooted phylogenetic tree to explore their evolutionary relationship. According to their homology with NAC proteins in Arabidopsis, 80 FtNAC genes were divided into 14 subgroups (Fig. 1). In our analysis, we found that the NAC proteins in Tartary buckwheat had representatives from the ANAC063, NAM, NAC1, OsNAC7, ANAC011, TIP, OsNAC8, NAC2, ONAC22, TERN, SENU5, NAP/ANAC3, ATAF, and ONAC003 subgroups. However, in Tartary buckwheat, no NAC members from the ANAC001 subgroup were identified. The subgroups OSNAC8 and ANAC063 each contained only one FtNAC protein, whereas the subgroup OSNAC7 contained the greatest number (11) of FtNAC proteins. The ATNAC3 and NAP members represented a single clade (Figs. 1 and 2a). In an earlier analysis, these two classes were reported to be sister taxa, suggestive of their coevolution [47, 55]. These results indicate that the functions of FtNAC genes in Tartary buckwheat are diverse, which is consistent with the reports in Arabidopsis and rice. A phylogenetic tree was constructed from 80 amino acid sequences of FtNAC, and the gene family was divided into thirteen subgroups, named I-XIII, according to bootstrap values and motif composition (Fig. 2a). The largest, subgroup I, had 12 members, whereas the subgroups V and X had only two members. Two NAC genes, FtNAC75 and FtNAC56, could not be assigned to any subgroup because they had low bootstrap values. To analyze the structure of FtNAC genes, we compared the genomic DNA sequences to analyze the composition of introns and exons (Fig. 2b). The coding sequences of the entire FtNAC family were interrupted by introns, with the number of exons ranging from 1 to 8 (Fig. 2b). FtNAC24 had 7 introns, whereas FtNAC17 contained no introns in the open reading frame (ORF). The gene structure is relatively conserved within the NAC gene family; among its members, the majority of genes have 3 exons (Fig. 2b). In general, the closest members from the same subgroups had a similar exon/intron structure with regard to intron number, intron phase, and exon length. To further study the characteristic regions of FtNAC proteins, the motifs of 80 FtNAC proteins were analyzed online using MEME. Ten conserved motifs were predicted, and the specific amino acid sequences of each motif were also provided (Fig. 2c, Additional file 2: Table S2). We found that most of the closely related members in the phylogenetic tree showed common motifs with the same alignment and position, which indicates that the members of NAC that clustered in the same subgroup may have similar biological functions. Most of the FtNAC proteins contained motif 3 (subdomain A), motif 6 (subdomain B), motif 1 and motif 5 (subdomain C), motif 4 and motif 2 (subdomain D), and motif 7 (subdomain E) in succession. Notably, some conserved motifs in specific subgroups were identified. All of the FtNAC proteins in subgroup XIII lacked motif 1 and motif 6 and contained motif 8, and all of the members of subgroup III contained motif 9. Additionally, all of the FtNAC proteins in subgroup II contained motif 10, except for FtNAC37 and FtNAC74, which contained only 2 motifs. This pattern suggests that the specific motifs may be related to specific functions of different subgroups. The motif composition and gene structure of the members from each subgroup obtained from phylogenetic analysis were similar, which indicates that the classification was more reliable. In comparison with the existing NAC genes of Tartary buckwheat, we also studied the evolutionary diversification of NAC genes. A phylogenetic tree was constructed containing the NAC protein sequences from one monocotyledonous plant (rice) and seven dicotyledonous plants (Arabidopsis thaliana, Tartary buckwheat, beet, soybean, tomato, sunflower and grape) using Geneious R11. All NAC proteins were divided into twenty-three subclades within the phylogenetic tree. However, a number of sequence relationships were not well defined (Fig. 3). Using MEME, ten different conserved motifs were found, among which motif 2 and motif 9, motif 5, motif 1 and motif 6, motif 4 and motif 3, and motif 7 encoded NAC subdomains A-E, respectively. (Fig. 3). Notably, all of the NACs without motifs 9, 5 and 1 had motif 8 in the N-terminal but not in the C-terminal (Fig. 3). Additionally, some NACs contained at least one of the motifs 1, 3, 4, 5, 6, 7, or 9 in the C-terminal and N-terminal simultaneously (Fig. 3). The majority of NAC proteins in the same clade, particularly the most closely related proteins, typically shared common motifs (for example, FtNAC49 and Glyma.08G009700.1.p), indicating a similar potential function between these NAC proteins. A total of 80 FtNAC genes were unevenly distributed on 8 chromosomes of Tartary buckwheat (Fig. 4). The largest, chromosome 1, had the most FtNAC genes (21, ~ 25.93%), followed by the smallest, chromosome 8 (11, ~ 13.58%) and chromosome 7 (10, ~ 12.35%), whereas there were only six genes in chromosome 5 (~ 1.31%) (Fig. 4). To identify the duplication events in FtNAC genes, a collinearity analysis was performed using MCScanX software. Fourteen pairs of fragment duplication genes were found in 80 FtNAC genes (Fig. 5). Fragment duplication genes were the most common on chromosome 1, followed by chromosome 3, whereas there were no fragment duplication gene pairs on chromosome 7 (Fig. 5). To further explore the evolutionary relationship of the Tartary buckwheat NAC family, we constructed a phylogenetic tree consisting of six dicotyledonous plants (Arabidopsis, beet, tomato, soybean, sunflower and grape) and a monocotyledonous plant (rice) (Fig. 6). The order of genome size was as follows: sunflower (3.6 Gb) , soybean (1.025 Gb) , tomato (828.349 Mb) , beet (714–758 Mb) , grape (490 Mb) , rice (466 Mb)  and Arabidopsis thaliana (125 Mb) . In total, 43 FtNAC genes displayed a syntenic relationship with grape, followed by soybean (40), tomato (40), beet (29), Arabidopsis (20), sunflower (15) and rice (6). The number of homologous pairs in the other seven species (soybean, tomato, Arabidopsis thaliana, grape, beet, sunflower and rice) were 73, 36, 28, 24, 21, 17 and 6, respectively (Additional file 3: Table S3). Tartary buckwheat chromosome 1 had the most homologous gene pairs with other species. In addition, the number of gene pairs between Tartary buckwheat and other species was not related to the genome size of the other species. 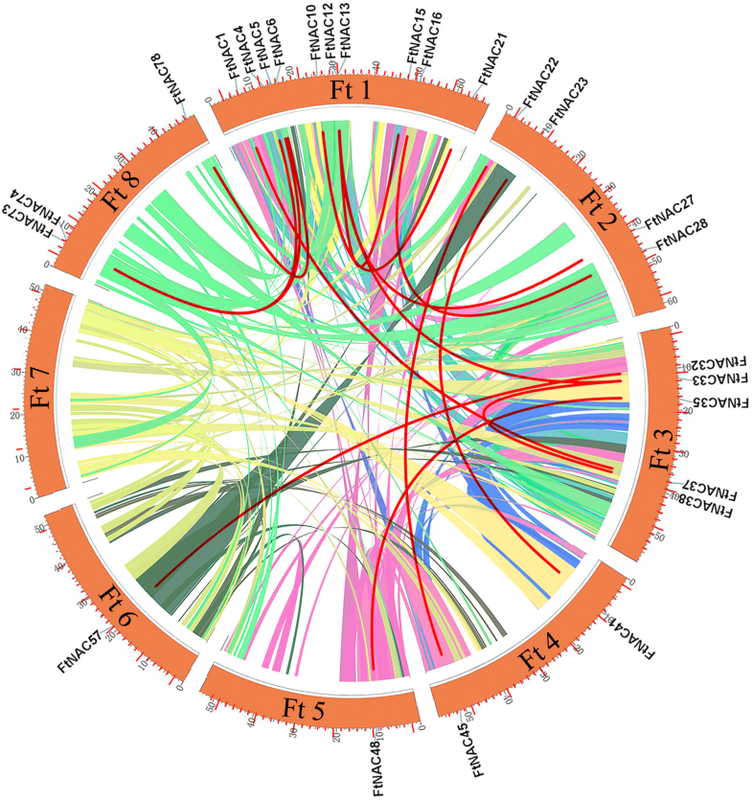 Some FtNAC genes were formed in at least six syntenic gene pairs, particularly those of Tartary buckwheat and soybean, such as FtNAC3 and FtNAC46, which may play a vital role in the evolution of the NAC gene family. Tartary buckwheat and rice shared less than 10 colinear gene pairs, which may be associated with the phylogenetic relationship between these species. To explore the physiological role of the FtNAC genes, we randomly selected 32 genes distributed among the branches (Fig. 2, Additional file 4: Table S4) and performed qPCR. The expression levels of 32 FtNAC genes in stem, root, leaf, fruit and flower tissues were evaluated (Fig. 7a). As shown in Fig. 7, the various expression patterns of each gene in different tissues indicated that FtNAC genes perform different functions in Tartary buckwheat. Three FtNAC genes (FtNAC43, FtNAC46 and FtNAC58) were more highly expressed in roots than in other organs. (Fig. 7a). FtNAC70 was highly expressed in flower tissue, and FtNAC36 was highly expressed in leaf tissue (Fig. 7a). FtNAC14 was highly expressed in both leaf and stem tissue (Fig. 7a). FtNAC31 was highly expressed in all organs of Tartary buckwheat and may play crucial roles in adaptation to the environment during plant growth and development. In addition, the expression patterns of some FtNAC genes in the same subgroup were similar in Tartary buckwheat, such as four genes in subgroup VII (FtNAC73, FtNAC32, FtNAC50 and FtNAC45) and three genes in subgroup II (FtNAC68, FtNAC67 and FtNAC8) (Figs. 2 and 7a). Furthermore, FtNAC32 and FtNAC45 were duplicated FtNAC members. However, some duplicated FtNAC genes (FtNAC15 and FtNAC38, FtNAC35 and FtNAC41, etc.) in the same subgroup showed diffe rent expression patterns (Figs. 2, 5 and 7a), indicating that the functions of these genes may have changed during the evolution of Tartary buckwheat. In general, understanding the expression patterns of FtNAC genes in different tissues can lay a foundation for identifying functional genes in Tartary buckwheat. We also studied the correlation of expression patterns for 32 FtNAC genes in Tartary buckwheat (Fig. 7b). Most of the FtNAC genes were positively correlated, and all of the FtNAC genes that were significantly correlated (FtNAC43 and FtNAC58/FtNAC46/ FtNAC33/FtNAC7, FtNAC14 and FtNAC56, FtNAC42 and FtNAC68/FtNAC64/FtNAC67/FtNAC2, etc.) were found to be positively correlated (Fig. 7b). NAC transcription factors have been studied in many plants in relation to plant development and biological stress, but only a few studies have evaluated their role in fruit development. Tartary buckwheat is a nutritional and medicinal crop, and as with other cereal crops, the fruit of the Tartary buckwheat is the most important part and of the greatest concern. The expression levels of 23 FtNAC genes in three fruit development stages were determined by qPCR to explore the function of these genes. (Fig. 8a). The expression of three FtNAC genes (FtNAC42, FtNAC34 and FtNAC15) showed a consistent decreasing trend across the three fruit development stages, whereas FtNAC3 showed an increasing trend (Fig. 8a). The expression of FtNAC45 initially decreased and then increased across the three fruit development stages. FtNAC56 was expressed at a similar level at all three stages. We also studied the correlation of expression patterns for 23 FtNAC genes at three fruit development stages in Tartary buckwheat (Fig. 8b). Based on the correlation results, we observed that most FtNAC genes were positively correlated and that the FtNAC genes were significantly correlated (FtNAC29 and FtNAC67/FtNAC8, FtNAC6 and FtNAC38/ FtNAC15, etc.) were found to be positively correlated (Fig. 8b). The NAC domain protein family is a larger plant-specific TF family. In recent years, 117 proteins have been identified in Arabidopsis thaliana , 151 in rice , 167 in cassava , 104 in pepper , and 180 in apple , but there are few studies on the NAC family in Tartary buckwheat. However, in previous studies, eight FtNAC genes were cloned and found to respond to at least one treatment, among which FtNAC4(FtNAC5) and FtNAC7(FtNAC31) showed extremely significant responses to salt, drought, ABA, and SA treatments . In the current study, we identified 80 members of the FtNAC family (Fig. 1), which were designated FtNAC1 to FtNAC80 on the basis of their chromosomal locations (Fig. 4, Additional file 1: Table S1). Clearly, the NAC gene family in Tartary buckwheat is by far the smallest compared with that in other plant species. This size difference can be attributed to the genome of Tartary buckwheat containing fewer NAC genes than other plants, probably because more duplication events have occurred in other species after differentiation from their earliest ancestors. The duplication of genes can amplify the number of genes; for example, four large duplication events have occurred in the Arabidopsis genomes [63, 64]. The ρ genome duplication (WGD) event is inferred to have occurred after different lineages, while the σWGD event occurred in all Poales . Hence, the low number of FtNAC genes may be due to the absence of a ρWGD event during the evolution of Tartary buckwheat. The genome size of each species was very different (such as Tartary buckwheat, 489.3 Mb ; Arabidopsis thaliana, 125 Mb ; rice, 466 Mb ; soybean, 1.025 Gb ), indicating that the NAC gene family was stable in different species during evolution. Although the length, MW and pI of NAC genes vary greatly, the structure of the genes were relatively conservative; among these FtNACs, the majority of genes have 3 exons (Fig. 3b), while the number of exons ranged from 1 to 8 . The gene structure of NAC genes in Tartary buckwheat was similar to that of NAC genes in rice and cassava [42, 47]. A collinearity analysis of the data in this study showed that there were 14 pairs of fragment replication genes without tandem replication events (Fig. 5). Therefore, chromosome fragment replication events drive the evolution of FtNAC genes, which greatly facilitates the expansion of the NAC gene family in plants with smaller genomes. The duplicated FtNAC genes may have functional redundancy. Among the 14 duplicated gene pairs, FtNAC32 and FtNAC45 have a similar, consistent pattern of expression. In the current theory, duplicated genes may pass through 4 selection modes , which may result in differences in expression patterns. There is evidence of this from the expression patterns of FtNAC35 and FtNAC41. FtNAC35 had the highest expression level in roots, followed by stems, while FtNAC41 had no expression in stems and the highest expression in leaves. In our study, the NAC genes in the phylogenetic tree of related species were relatively similar, and many branches contained the NAC genes from dicotyledons and monocotyledons, which indicates that the diversity of NAC genes appeared before the differentiation of monocotyledons and dicotyledons (Fig. 3) . Collinearity analysis showed that there were only 10 pairs of homologous genes in Tartary buckwheat and rice, whereas more orthologous gene pairs were found in six of the dicotyledonous leaves, including those of soybean and tomato (Fig. 6). Consistent with the phylogenetic relationship between Tartary buckwheat and the other seven plants, this analysis suggests that the NAC genes in dicotyledonous leaves are more homologous and consistent. The domains and motifs of transcription factors are often related to protein interaction, transcriptional activity and DNA binding . The conserved motifs in the N-terminus of the NAC genes have highly conserved DNA-binding abilities (Fig. 2c), which indicates that these motifs are very important for the function of NAC genes . Motif analysis showed that most of the NAC genes of Tartary buckwheat contained motif 1 to motif 7 (Fig. 2c). However, among the FtNAC members in subgroup XIII, motif 8 (DEFIPTLDGEDGICYTHPEKLPGVTKDGLARHFFHRPSKAYTTGTRKRRK) replaced motifs 1 (part of subdomain C, binds to DNA) and 6 (subdomain B, has distinctive functions) (Fig. 2c), which might confer a distinctive function to this subgroup [7, 11]. In an evolutionary analysis of NAC genes in several different plants, it was also found that motif 8 (EFIPTJEGEBGICYTHPEKLPGVTKDGLSRHFFHRPSKAYTTGTRKRRKI) replaced motifs 5 (part of subdomain A, promotes functional dimerization), 9 (subdomain B) and 1 (part of subdomain C), although they were not all present together (Fig. 3). The genes of subgroup XIII cluster with the ONAC003 subgroup containing Arabidopsis AT4G28500, which has been found to function in the formation of secondary cell wall fibers . FtNAC25 and FtNAC2, the genes of subgroup XIII, were expressed in all tissues. We speculate that most of the genes in subgroup XIII have similar expression patterns due to their common conserved motifs and thus play a role in secondary wall formation. Valuable insights regarding the roles of FtNAC genes involved in specific Tartary buckwheat physiological processes were obtained from the different expression patterns of FtNAC genes. The biological function of new proteins is typically assigned through alignment with homologous sequences in Arabidopsis. Several studies have assigned a wider range of functions to NAC proteins using this approach, such as temperature stress in Chinese cabbage  and dehydration stress in soybean . In a multispecies phylogenetic tree, genes in one branch often have the same function. Therefore, the function of NAC in Tartary buckwheat was predicted by clustering with Arabidopsis NAC protein sequences in the phylogenetic tree. Gene expression is a basic form of evidence for gene function. qPCR analysis revealed that FtNAC70 may be involved in the development of flowers. FtNAC43, FtNAC46 and FtNAC58 may play a role in the roots because they exhibit a higher expression level in roots. FtPinG0009426800.01 was the most highly expressed in leaves and may play a role in leaf development. The expression pattern of FtNAC15 was different from that of FtNAC38, although the two genes are duplicated genes within the same subgroup. The NAM groups may regulate cell division and leaf development [16, 17, 70–73]. The NAM subgroup gene FtNAC14 is most highly expressed in the leaf followed by the stem and is orthologous with AT5G53950.1(CUC2), indicating that FtNAC14 may function in leaf development through expression in both the leaf and stem (Fig. 7a). The multispecies evolutionary analysis showed that they fall in the same subgroup and have the same motif composition (Fig. 3). The proteins of a given subgroup contain the same motif, indicating that the NAC genes of the same subgroup may perform similar functions . 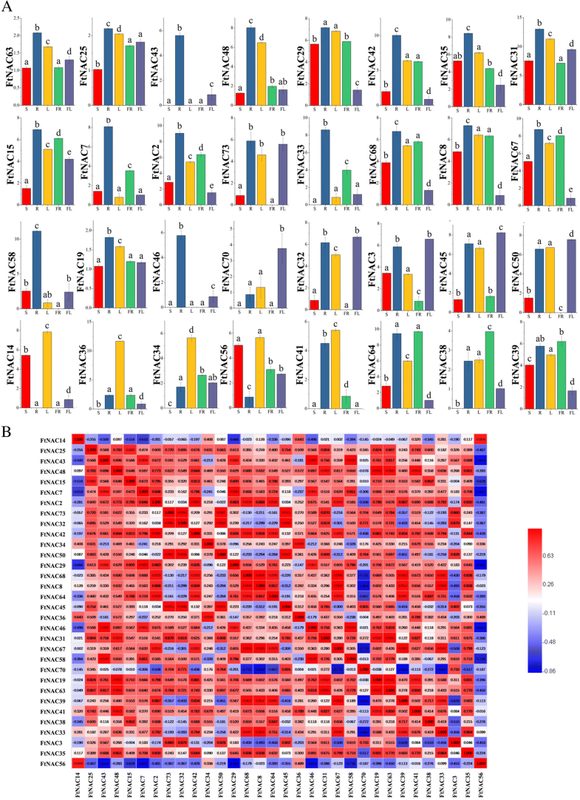 The expression of FtNAC56 was significantly positively correlated with the expression of FtNAC14 (Fig. 7b). The overexpression of homologous genes AT2G02450.1 (LOV1) in switchgrass alters the leaf angle, cell wall composition, and flowering time . FtNAC56 was also most highly expressed in the leaf followed by the stem, suggesting that these two genes have synergistic functions in leaves and stems. Although they belong to different subgroups, they have the same motif composition (Figs. 2 and 7a). Thus, FtNAM may participate in leaf development. These results suggest that FtNAC genes are extensively involved in the root, stem and leaf development of Tartary buckwheat. Among the 32 FtNAC genes, most were expressed in fruits, although 8 FtNAC genes were not expressed (Fig. 7a). Therefore, we explored the expression pattern of 23 FtNAC genes at three developmental stages of Tartary buckwheat fruit. Fruit development is an essential process of cell division, differentiation and expansion, which determines fruit quality. In Tartary buckwheat, the most noticeable changes were fruit size and texture, which were related to the activity of different genes [74, 75]. In previous studies, the development of Tartary buckwheat fruit was divided into five stages . We selected three representative stages (13DAP, 19DAP and 25DAP) corresponding to the initial filling stage, milk stage and initial maturity stage to study the role of FtNAC genes in fruit development. FtNAC45, which belongs to the NAP and AtNAC3 subgroups, initially decreased and then increased during the three fruit development stages and may play a role in the fruit development of Tartary buckwheat. FtNAC45 and FtNAC31 showed similar expression patterns at 13 DAP and 19 DAP but exhibited differences at 25 DAP. The overexpression of SlNAC1 alters fruit pigmentation and softening , whereas the suppression of tomato SlNAC1 delays fruit ripening . ATAF2 is orthologous to SlNAC1  and is involved in auxin biosynthesis , which influences the fruit size of Tartary buckwheat . There was a positive correlation between auxin concentrations and cell division or final seed size in a comparison of two kinds of Tartary buckwheat from 7 to 19 DAP . The size of the fruit is mainly determined by the early development of the embryo, not by the later stage [81, 82]. FtNAC31 is orthologous to AT5G08790.1 (ATAF2) (Fig. 3) and is highly expressed at 13 DAP and may function in the early stages fruit development in Tartary buckwheat. Both FtNAC67 and FtNAC68 are highly expressed at 13 DAP and 19 DAP. These two genes cluster to OSNAC7. Genes in this subgroup have been reported many times to function in secondary wall biosynthesis [29–34, 36, 37, 83]. 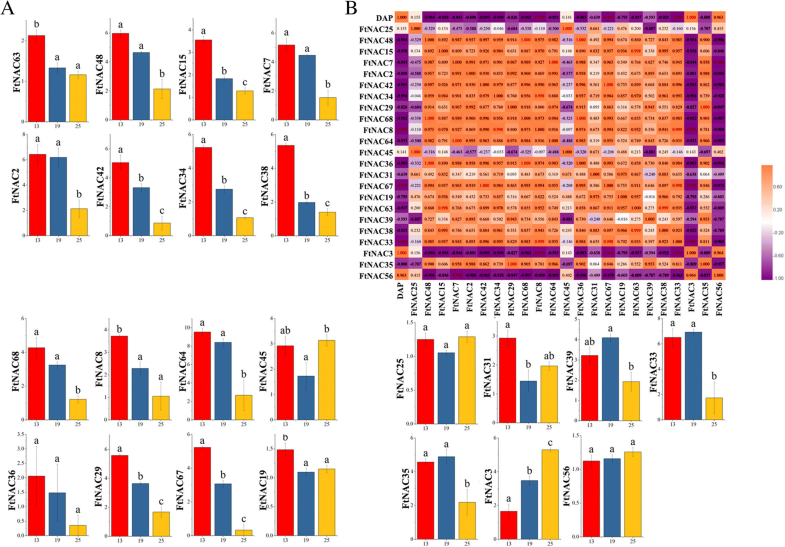 This result suggests that the FtOSNAC7 genes function in the secondary wall biosynthesis of Tartary buckwheat fruit, with the development from 13 DAP~ 19 DAP, Tartary buckwheat fruit gradually developed completely . According to the expression patterns of FtNAC genes, it can be speculated that these genes may be involved in similar regulatory networks, but the specific function of FtNAC genes in Tartary buckwheat fruit needs to be further verified. In our study, a comprehensive analysis including gene structure, chromosomal location, sequence homology synteny and expression patterns of the NAC gene family in Tartary buckwheat was first performed. We identified a total of 80 FtNAC genes in Tartary buckwheat, which will provide basic information for the functional characterization of FtNAC genes. Furthermore, expression analysis of FtNAC genes in various tissue and developmental stages of fruit implied that FtNACs may participate in the development of Tartary buckwheat. These data are useful for further exploration of NAC gene-mediated physiological processes in Tartary buckwheat. This systematic analysis of the NAC gene in Tartary buckwheat is helpful for the follow-up study of the functional characteristics of FtNAC genes and the cultivation of high-quality Tartary buckwheat varieties. We downloaded the genome of Tartary buckwheat from the TBGP (Tartary Buckwheat Genome Project; http://www.mbkbase.org/Pinku1/). The FtNAC genes were obtained using two BLASTP methods. First, all AtNACs were used to search possible FtNACs on the TBGP website, and further identified using BLASTP  (score value ≥100 and e-value ≤1e− 10) . Second, we downloaded the hidden Markov model (HMM) file of the NAC domain (PF 02365) through Pfam (http://pfam.xfam.org/). All genes were retrieved using HMMER 3.0 (default parameters) with a cutoff of 0.01 . The possible FtNACs were confirmed with PFAM and SMART programs [86, 87], and the HMMERs were used to further verify the results. Finally, all NAC gene models were used to analyze the CDS length, MW, PI and subcellular localization using tools on the ExPasy website. To explore the structure of FtNAC genes, ClustalW (default parameters) was used . We used the GSDS (Gene Structure Display Server) analysis to analyze the constituents of the exons/introns of the FtNAC genes. We used MEME to analyze the motifs of FtNAC proteins, (http://meme-suite.org/tools/meme), with the parameters as follows: motif width set to 6–200 and number set to 10 [53, 89]. Circos were used to locate FtNAC genes on the chromosomes of Tartary buckwheat. We used MCScanX (default parameters) to examine duplication genes . 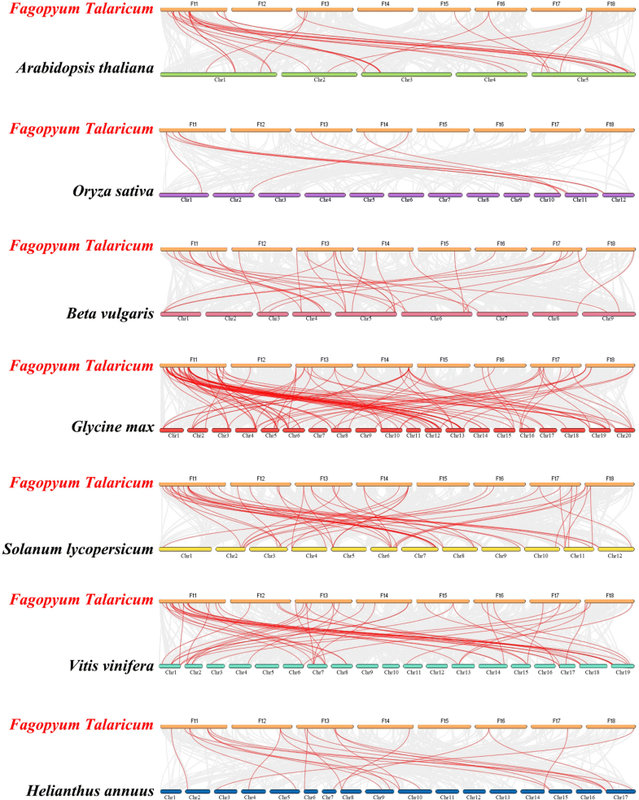 We analyzed the homology of the NAC gene between Tartary buckwheat and the other seven plants using Dual Synteny Plotter (https://github.com/CJ-Chen/TBtools). According to the classification of AtNAC, all the identified FtNAC genes were divided into different groups. NAC protein sequences (from Arabidopsis, rice, beet, soybean, tomato, sunflower and grape) were obtained by UniProt https://www.uniprot.org/). The NJ phylogenetic trees were constructed using Geneious R11 with Blosum62 cost matrix, the Jukes-Cantor model, global alignment with free end gaps and bootstrap value of 1000. Xiqiao is produced by physical mutagenesis and is characterized by higher rutin and crude protein contents. It has many advantages, such as a high seed setting rate, strong anti-falling ability, high 1000-grain weight and many grains per plant . Xiqiao was planted in a field of the Sichuan Agricultural University (29°97’ N, 102°97′ E; elevation, 580 m), Ya’an, Sichuan, China and in a consistent growth environment for five consecutive years since 2013. The flower, fruit from three different fruit developmental stages (13, 19, and 25 DAP) , stem, root, and leaf from the maturity period were collected from three different Tartary buckwheat plants with identical developmental statuses. Samples were quickly frozen in liquid nitrogen after collection and stored at − 80°C before use. The selected gene expression analysis used qPCR, and primers were designed by Primer3 (Additional file 4: Table S4). We used the FtH3 gene, which was stably expressed at each growth stage in almost all tissues, as an internal control . The qPCR with SYBR Premix Ex Taq II (TaKaRa) was repeated at least three times and the data were analyzed using the 2−(∆∆Ct) method . The data were analyzed using Origin Pro 2018b, and the means were compared using LSD at the 0.05 and 0.01 levels of significance. Moyang Liu and Zhaotang Ma contributed equally to this work. We thank all colleagues in our laboratory for helpful discussions and technical assistance. This research was supported by the National Natural Science Foundation of China (31500289) and the National Key R&D Program of China (2018YFD1000706). The datasets supporting the conclusions of this article are included in the article and in its additional files. M.-Y.L. planned and designed the research and analyzed the data. Z.-T.M. wrote the manuscript. W.-J.S., L.H., Q.W., Z.-Z.T., T.-L.B., and C.-L.L. performed the experiments. H.C. supervised the research. M.-Y.L. and Z.-T.M. contributed equally. All authors read and approved the final manuscript.